English learners (ELs) bring a wealth of ideas, perspectives, and solutions to STEM education. However, according to a report from the National Academies of Sciences, Engineering, and Medicine (2018), the nearly 5 million students classified as ELs in public schools are falling behind when it comes to STEM education. Particularly, as it relates to learning science and mathematics, ELs lack opportunities to engage with challenging disciplinary practices and content. Preparing teachers so that all students can reach their full potential in STEM can transform the lives of individual students and society as a whole. Are you an elementary school teacher working to enhance your knowledge and understanding of the Next Generation Science Standards (NGSS)? Register to participate in the Shifting to the NGSS: Professional Book Study, taking place in May, 2019! 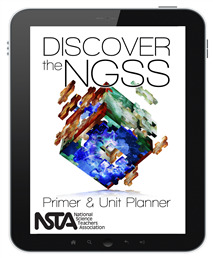 NSTA has developed an Online Book Study around the Enhanced E-book: Discover the NGSS: Primer and Unit Planner. This enhanced e-book offers a comprehensive introduction to the NGSS, including background information, each of the three dimensions in depth, and steps to move teachers toward classroom implementation. Are you an elementary school teacher working to enhance your knowledge and understanding of the Science and Engineering Practices from A Framework for K-12 Science Education and the Next Generation Science Standards (NGSS)? Register to participate in the Science and Engineering Practices: Professional Book Study, taking place in May-June, 2019! 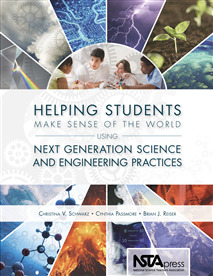 NSTA has developed an Online Book Study around the book Helping Students Make Sense of the World Using Next Generation Science and Engineering Practices. This book provides a play-by-play understanding of the practices, written in clear, nontechnical language. Through a wealth of real-world examples you will discover what’s different about three-dimensional teaching and learning at all grade levels. Join us on Tuesday, April 23, from 7:00 – 8:00 pm Eastern time to learn about the current status of Kilauea and the 2018 Kilauea Summit and Lower East Rift Eruptions. During this natural disaster, outbreaks of lava fountains up to 300 feet high, lava flows, and volcanic gas were preceded by earthquakes and ground deformation that created cracks on the roads. As a result, thousands of people living in the Leilani Estates subdivision on the island of Hawaii had to be evacuated; some with injuries. All participants will receive a certificate of participation and 100 Learning Center activity points for attending and completing the post-program evaluation. An archive and presentation slides will be available at the end of the program. During the online book study, elementary school teachers attend live web seminars and participate in asynchronous discussions with other participants and with the web seminar presenters, Tricia Shelton and Jessica Holman. The web seminars support use of the Enhanced E-book to deepen participant understanding of the innovations of the NGSS. Presenters also share examples and stories from the classroom to illustrate HOW this understanding can be used to translate the NGSS into classroom teaching and learning. English learners (ELs) bring a wealth of ideas, perspectives, and solutions to STEM education. However, according to a report from the National Academies of Sciences, Engineering, and Medicine (2018), the nearly 5 million students classified as ELs in public schools are falling behind when it comes to STEM education. Particularly, as it relates to learning science and mathematics, ELs lack opportunities to engage with challenging disciplinary practices and content. Preparing teachers so that all students can reach their full potential in STEM can transform the lives of individual students and society as a whole. Join us on Saturday, May 4th, starting at 10 am Eastern, to learn strategies teachers can use to enhance the classroom experience of ELs in STEM subjects. Join us on Wednesday, May 15, from 7:00 - 8:00 pm Eastern time to learn about the state of plastic pollution across our seas. Marine debris and microplastics are commonly found along beaches and in the ocean. The impact of these plastics are economic as well as ecological and need to be addressed. In this web seminar we will cover the overarching problems, some specific effects and strategies that educators can use in classrooms for prevention. During the online book study, elementary school teachers attend live web seminars and participate in asynchronous discussions with the presenters, Ted Willard and Tricia Shelton. The web seminars support use of the book to deepen participant understanding of the science and engineering practices. Presenters also share examples and stories from the classroom to illustrate HOW this understanding can be translated into classroom teaching and learning. Join us on Tuesday, June 18, from 7:00 - 8:00 pm Eastern time to learn about our star: The Sun. The sun is an average star in an average galaxy, floating in a universe that is perhaps only one of an infinite number of universes. As diminutive as this might sound, it is chiefly responsible for all life on Earth, the wind and the rain, the environment of space, and in shaping the design and composition of the entire solar system. In this science update, we will look at the role the sun has played in shaping the many bodies in the solar system, the impact it has on life, technology, and society, and its future among the stars. Register for Upcoming Web Seminars! Register for Upcoming Conferences and Purchase Archives! Register for Upcoming Book Studies and View Past Programs! Participate in #Science60. NSTA would like to recognize you!